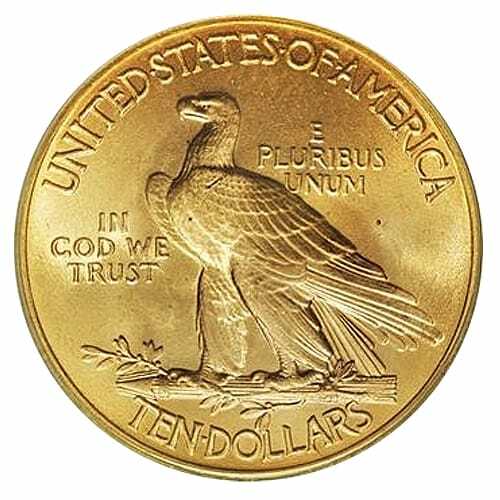 Saint-Gaudens originally resurrected the Liberty Head Eagle ($10) design in 1907 for the one cent piece. Roosevelt was so enamored with it that he asked for it to be used on the $10 piece, with the caveat that “something uniquely American” be added to it, the Indian headdress. 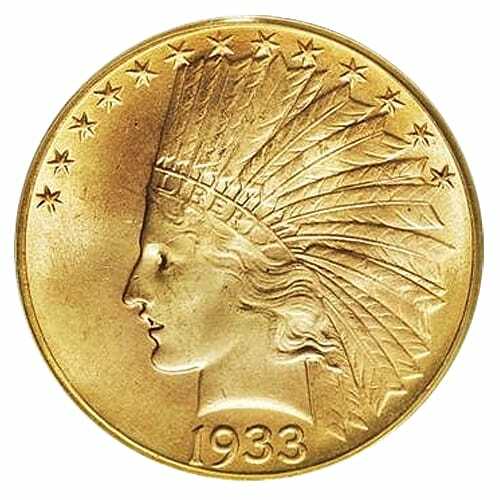 Roosevelt was determined to have the coins represent his vision of what a strong nation should have in its purse and bank vault, so few people dared to point out the incongruity of the lettering of “Liberty”, atop a native headpiece that a woman would never wear. The artist put up no struggle, and dutifully added the headdress, causing a bit of consternation among the staff of the Mint. The Indian Head Eagle caused a firestorm of public discontent when it was revealed that, due to Teddy Roosevelt’s disdain for the phrase “In God We Trust” appearing on money (he felt it truly a debasement of God), the words had been removed from the coin. This prompted Congress into action; they ultimately passed a bill mandating the phrase consistently appear on all currency of the United States. Five hundred coins of this design were struck in November of 1907. Eventually all but 50 were melted back down. It is an unusual and rare coin indeed. Eventually, the revised coin went into circulation in 1908 and was minted most years from 1908 to 1933, until Franklin Roosevelt’s signing of Executive Order 6102, also known as the Gold Confiscation Act. To learn more about Gold Indian Head Eagle ($10) coins and to get current pricing, please call us at (800)355-2116.